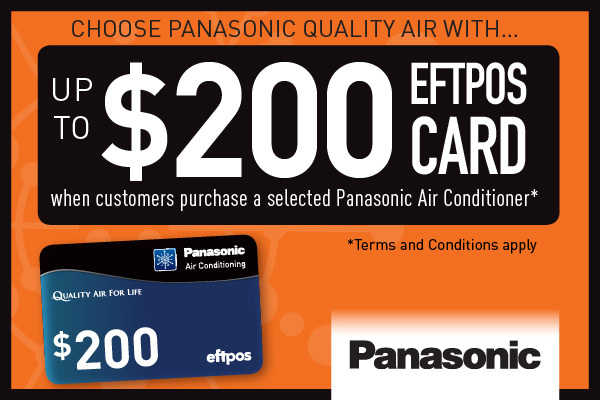 From April the first you’ll be able to claim a free EFTPOS card up to the value of $200* when you purchase a Panasonic air conditioner through Task Industries. To see what units are included and download a PDF Click Here. Terms and Conditions apply. To view in full and download, please Click Here. Purchase a selected Panasonic Air Conditioning System from a participating Authorised Dealer/Installer between 1 April and 30 June 2019. Please retain your original tax invoice/purchase receipt showing a zero balance for verification purposes. Visit www.panasonic.com.au/qualityair and complete the online Claim Form (including the serial number of outdoor unit). Claims must be received by 11.59pm AEST 21/07/19. We will send you updates throughout the process letting you know when your claim has been received, validated and when your Panasonic EFTPOS card is on its way. We will endeavour to send out all cards within 8 weeks from validation of your claim.